GORKHA, Sept 23: The locals of Sahid Lakhan Rural Municipality-7, Bungkot have taken the initiative of repairing a road with their own money. 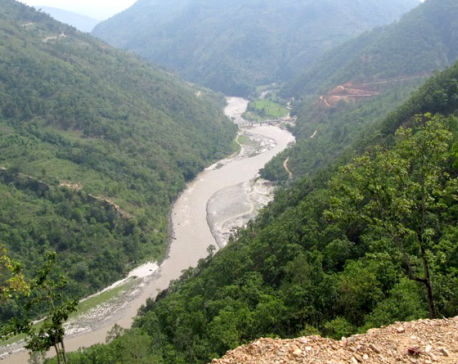 The obstruction of vehicular movement due to landslide ahead of the greatest Hindu festival Dashain has affected the supply of goods and materials. The reconstruction has finally picked up pace with the conclusion of the monsoon, but there are not enough workers. This has compelled the locals to get up and do it on their own. 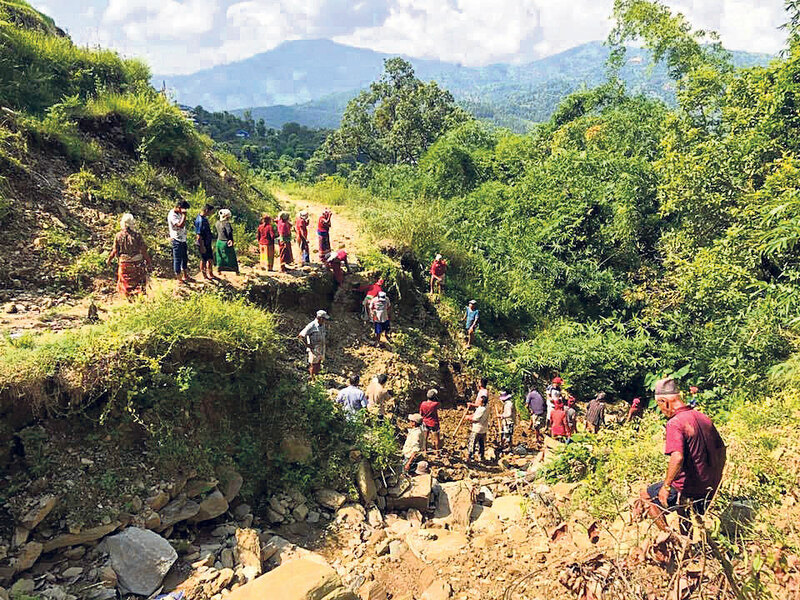 "We have urged one member from each family to join the repair work," said Dhan Bahadur Thapa, coordinator of construction committee, adding, "We have collected around Rs 40,000 from local youth, women and army clubs." The estimated cost of the repair work is Rs 350,000. Clearly, the money raised through donations will not be enough for the construction of the road. The landslide has washed away major sections of the road at 40 different places. Preparations are underway to collect Rs 500 to Rs 1,000 from each home for fencing and other work. As many as 350 households of Pipalchap, Maskichhapa, Aanpswanra and Charghare are benefited by this road. The obstruction of traffic on the road has compelled the villagers to carry construction materials and food on their backs. Currently, only motorcycles can ply the road following landslides. Ward member Gopal Rana laments that the acting chief of the rural municipality, Jiwan Ale and Vice-Chairperson Indira Tiwari did not pay heed to their plea despite being informed repeatedly. "They keep assuring help but do nothing," said Rana. Tired of waiting for the local unit to do something, locals decided to do it themselves. However, they have not stopped knocking doors of ward and rural municipality office seeking help. It has been challenging to carry ill people to the hospital since the obstruction of the road. As of now, patients are taken to hospitals on stretchers, which takes hours to reach. Every day, each member from 65 households of Maskichap and Aanpswanra are dedicating their four hours for the repair work. Meanwhile, ward chief Sharan Shrestha said that the rural municipality has been urged to utilize the budget sanctioned for the repair work. BAITADI, Aug 23: Various logistic materials including tents were handed over to the landslide victim families of Talladevi VDC-8 Dandakhali.